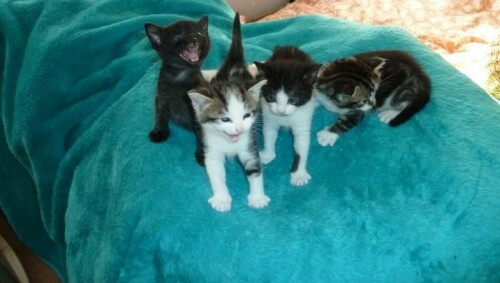 Lulu, Eliza, George and Babs are very lucky kittens indeed. We rescued their heavily pregnant mother from a street in East London on 1st November last year. Removed during a storm and the frightening noise of fireworks, she gave birth two days later in our care and thus was able to raise her beautiful kittens in a peaceful and safe environment. Had we not found her that night and taken her in, her kittens probably would not have lived through the first night. And their mother would already be pregnant again with more kittens born this spring, so it does not bear thinking what would have happened to them all. Although mother Eliza is the most hostile feral mother cat I have ever looked after, her kittens developed into completely domesticated and affectionate little cats because I picked them up and handled them the moment they started crawling around, investigating their long safety cage. This was only possible because the cage consists of three sections, which can each be partitioned off safely so that Eliza, sitting in her sleeping section, could not reach me when I took her kittens out for a cuddle. I was hoping so much that she would calm down and reveal herself eventually as an ex-domestic cat, like several before her, but even after three months she had not changed at all; her only two reactions were to spit and lash out whenever I approached the cage. I had her spayed and vaccinated and finally returned her to her feral family, but not until the cold weather had improved. Now 18 weeks old, the kittens have recently been spayed. Since kittens can come into season at only four months old, we like to have them neutered before they go to new homes. This practice ensures that the right moment is not missed, especially since it is often daunting for new owners to take their kittens to the vet for an operation within a few weeks of adoption; indeed, some new owners might put things off until it is too late. One optimistic cat owner had delayed the operation and kept his kitten indoors; however, when the kitten suddenly came into season, a tomcat came through the bathroom window during the night and had a ball with his new bride. By morning, the pair had shredded the front room to pieces and the owner was so distraught that the cat had to go. Although it had not been a kitten from us, I collected it, had it spayed and found it a new home. This true story is only one of the many examples that prompted us to write our leaflet, Why We Have Our Cats Neutered (available from our HQ address and on our website). Although early neutering is a comparatively new practice in Europe, it has been successfully performed in the US for over 20 years and no ill effects have been recorded. ← My cat is lost! What should I do?